I see that the Oxford Dictionary and Merriam Webster both have this as a closed compound. However, would it be considered acceptable to spell it with a hyphen: "micro-organisms"? Are the hyphenated (micro-organisms) and non-hyphenated (microorganisms) versions considered equally acceptable in British English. The premium Oxford online dictionary gives the non-hyphenated version as its main entry, but then goes on to give examples that exclusively employs the hyphenated version. That kind of thing is very confusing! 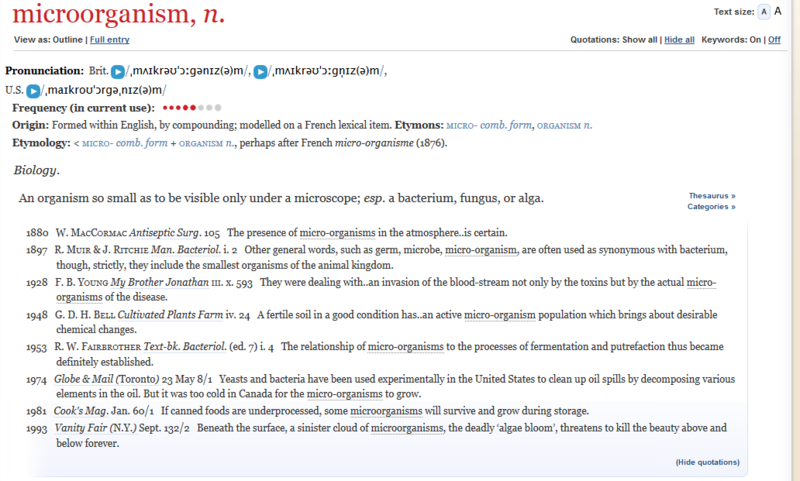 Micro-organic is hyphenated in the main entry. No examples are given under that word though. Would I be correct in suspecting that there has been a development in time towards increasing use of the closed compound? The examples in the OED, if they are meant to be representative, might suggest so, but there are not many examples, so it would entirely depend on whether they are intended to register a change. Goodness! I forgot that I asked here before about the acceptability of spelling the word as a hyphenated compound! Sorry about that! Would I be right to think it is more common now to spell it as a closed compound though also in British English? Thank you @joughtred! As you may have seen, I managed to ask again! I'd forgotten about asking here and obviously hadn't seen the answer. Memory lapse! Not to worry at all, and sorry it took us some time to address your question (we don't always manage to be on top of all the questions)! I hope you don't mind, but I merged the two threads so there is no duplicate question - but all the comments were preserved.